1.1Sailing will be governed by the guidance of the RYA Racing Charter, the current RYA Racing Rules of Sailing 2017-2020 (RRS), and these Sailing Instructions (below). 1.2Rule changes will be as follows: Flag Y will not be displayed. A "Personal Flotation Device" of an "International Standard Approved Type" will be worn by all crew while afloat or on the pontoon. This changes Rules 27.1 and 40. 2.1A fleet will comprise a minimum of six (6) boats of a single class. 2.2Wednesday evening . One race will be sailed comprising separate fast (PY<1098) and slow (PY>1098) handicap fleets. First sound signal made at 1900 hrs. 2.4Sunday racing. Will comprise morning and afternoon series. A maximum of four races will be sailed comprising separate fast (PY<1098) and slow (PY>1098) handicap fleets. First sound signal at 1100 hrs. 3.1As illustrated below in Section 6. 4.1Marks will be the fixed cans in the racing area. Additional marks (identified as marks X, Y, Z) may be used at the discretion of the race officer and notified to the competitors before the first sound signal. 4.2Start/Finish line will be a race committee boat at the starboard end (including any buoy, object or boat attached to it for the duration of the starting period), flying an orange flag and an orange buoy at the port end. 5.1Courses will be displayed on the map by the front entrance (for a Crow's nest start) or on the committee boat before the first sound signal. 5.2The order of marks, rounding hand and number of laps will be displayed on the committee boat. 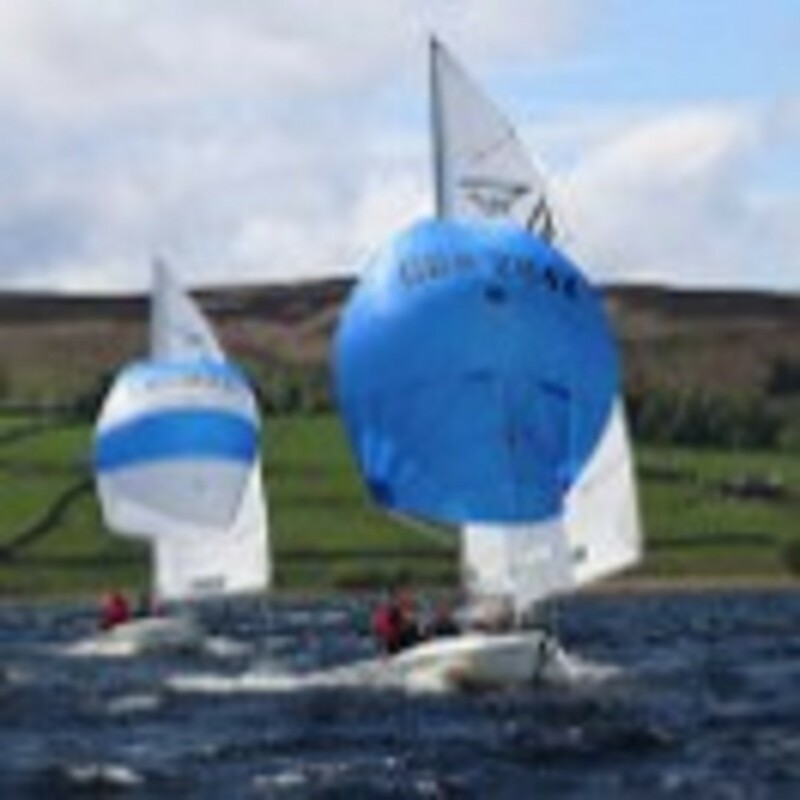 5.3If the race is shortened at the leeward mark, Flag S with two (2) sound signals will be displayed and competitors will round the leeward mark and finish at the finishing line. 5.4The shortened course shall be signalled before the first boat crosses the finish line. 5.5Boats should not go through the start/finish line on the downwind leg. 6.1The start sequences below changes RRS 26. 6.2The time sequence should be adjusted when a fleet is not represented. 6.2Times will be taken from visual signals; the failure of sound signals will be disregarded. 7.1The finish line will be a race committee boat at the starboard end (including any buoy, object or boat attached to it for the duration of the finishing period), with an orange flag and an orange buoy. Boats should round the leeward mark and proceed to the finishing line between the Committee Boat and the Finishing Buoy. 8.1A short submerged wall, which protrudes from the south shoreline, close to club mark H (Hunter) and is marked by a buoy. This must be passed to the north. 8.2Boats are excluded from the bird sanctuary to the west of club mark R (Ruffside). 9.1Time limits and a target are as follows: Target time (40 mins), Extension (15 mins), Time limit (55 minutes). 9.2Boats failing to finish within the extension time (see 9.1) after the first boat sails the course and finishes will be scored Did Not Finish (DNF).This changes RRS 35, A4, and A5.